With the 2016 elections just 10 weeks away, voters give Democratic presidential nominee Hillary Clinton a substantial advantage over Republican nominee Donald Trump on a wide array of health care issues, the latest Kaiser Health Tracking Poll finds. 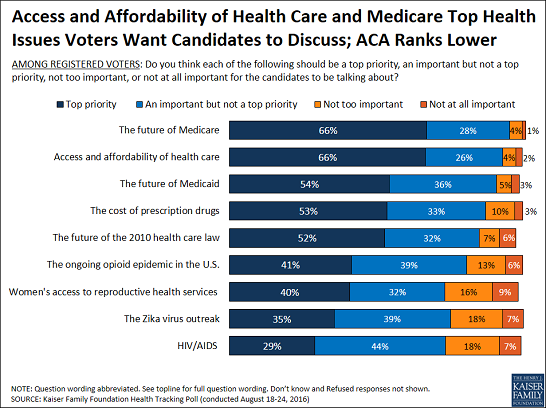 Two thirds of voters (66%), including large shares of Democrats, Republicans, and independents, identify access and affordability of health care and the future of Medicare, an issue not being widely discussed on the campaign trail, as top priorities for the presidential candidates to talk about during the campaign. Smaller majorities of voters say the same about Medicaid’s future (54%), prescription drug costs (53%), and the future of the 2010 health care law (52%). On each of those issues and several other health policy issues, more voters say they trust Clinton to do a better job than say they trust Trump, the poll finds. For example, Clinton leads Trump on Medicare’s future (53% compared to 38%), access and affordability to health care (52% to 39%), Medicaid’s future (54% to 37%), prescription drug costs (51% to 39%), and the Zika virus outbreak (54% to 34%). Among the nine issues asked about, Clinton’s largest lead is 36 percentage points on women’s access to reproductive health care (64% to 28%), while her smallest lead is on the future of the 2010 Affordable Care Act (50% to 41%). A majority of female voters (71%) say they trust Clinton to do a better job on women’s access to reproductive health services compared to one in five (20%) who say they trust Trump. Voters, age 65 and older, are split between which candidate they trust to do a better job dealing with the future of Medicare with a similar share saying they trust Trump (44%) as saying they trust Clinton (47%). In spite of Clinton’s edge with voters on these issues, most voters don’t expect much improvement in access to affordable care regardless of who wins the election. A third (33%) of voters say access to affordable care would get better across the country generally if Clinton wins; a similar share (29%) say so if Trump were to win. The poll also shows few voters expect their own ability to access affordable care to improve under either candidate. On each question, more voters say they expect the situation to get worse if Trump were elected than if Clinton were elected. KFF has been tracking public opinion on the Zika virus outbreak since February 2016, and this month’s survey finds three quarters (76%) of the public are aware that people in the United States have become infected from the bite of mosquitoes locally. A smaller majority (58%) is aware that travel warnings have been issued for areas in the United States affected by the outbreak. About half of the public (48%) say that they would not be comfortable traveling to places in the United States, like parts of Florida, where people have been infected by mosquitoes. Slightly more say the same about traveling to U.S. territories like Puerto Rico or to places outside the United States where people have become infected (59% and 61%, respectively). With Congress set to return from its August recess after Labor Day, the poll finds a third (36%) of the public views passing new funding to combat Zika as a top priority for Congress. An additional 40 percent say it is an important, but not top, priority. Democrats are more likely than Republicans or independents to view Zika as a top Congressional priority, though large majorities within each group consider it at least an important priority. The survey also probes the public’s experience and views with electronic medical records. Today, 80 percent of the public says their doctor or other healthcare provider usually enters their health information into a computer while they are present – up sharply since 2009, when an earlier KFF poll found 46 percent said this usually happened. Half (52%) now say it is “very important” for their providers to use electronic medical records, up from 42 percent in 2009. About eight in ten (78%) Americans say they have at least some medical records and personal health information available online. Of these, 60 percent (47% of total population) say they are either “very” or “somewhat” concerned that an unauthorized person might get access to their confidential records and information. Americans’ opinion of the health care law remains split with 40 percent saying they have a favorable view and 42 percent saying they have an unfavorable view. When asked about the news media’s coverage of the health reform law, four in ten say that the coverage is mostly balanced while 27 percent say it is biased in favor of the law and 21 percent say it is biased against the law. About half (47 percent) of Republicans say the news media coverage of the health reform law is biased in favor of the law while half of Democrats and 43 percent of independents say the news coverage is mostly balanced. Designed and analyzed by public opinion researchers at the Kaiser Family Foundation, the poll was conducted from August 18-24 among a nationally representative random digit dial telephone sample of 1,211 adults. Interviews were conducted in English and Spanish by landline (423) and cell phone (788). The margin of sampling error is plus or minus 3 percentage points for the full sample. For results based on subgroups, the margin of sampling error may be higher.